After nearly a decade on Blogger, The Busybody has come to WordPress. Blogger has been increasingly unreliable since the Google takeover, so I’ve migrated. I’ll be keeping the old blog up, so don’t fear: if you’ve linked to my posts over the years, they will be preserved. But the old posts are now on the new blog as well, and moving forward, I will only be posting at WordPress. This first post will serve as a looking back on some of my popular hits from the past nine years (as Sitemeter reports them), which you can revisit below and see how things look in the new template. Abraham the “Father of Everyone”? “The quote on the left [see image to the right] is not Robertson’s at all. It is a quotation of 1 Corinthians 6:9–10. Remarkably, two of the three quotes attributed to Robertson… are not Robertson’s words at all but rather direct quotes from the New Testament (the other coming from Rom 1:24–32). “It’s also worth noting that Pope Francis presumably agrees with these quotes from the apostle Paul, which have long guided Catholic tradition in this area; he has simply changed the rhetoric surrounding the issue to emphasize that the Church does not and (at least in terms of doctrine) has never reduced people to behavior or desires, emphasizing that a person is more than his/her sexual preferences or choices. Robertson, of course, said much the same thing, though far less eloquently than the philosophically-trained Pope, in his GQ interview. This is well put, and is the same problem we’ve seen repeatedly when post-9/11 critics quote the Qur’an and are then accused of misrepresenting the Qur’an. It happens all the time to Robert Spencer when he quotes militant passages preaching hate and warfare against non-Muslims, and when he furthermore points out that there is currently no mainstream sect of Islam or school of Islamic jurisprudence that has officially re-interpreted or spiritualized these passages. (All four schools of Islamic jurisprudence still teach that the Muslim community should wage war against unbelievers and subjugate them under its rule.) Of course, there are millions of Muslims who ignore this and choose to co-exist peacefully with others; but that doesn’t change what the Qur’an actually teaches and what mainstream Islam continues to uphold. As an analogy, the Catholic Church continues to affirm the intrinsic immorality of contraceptives, even if many Catholics ignore the teaching. 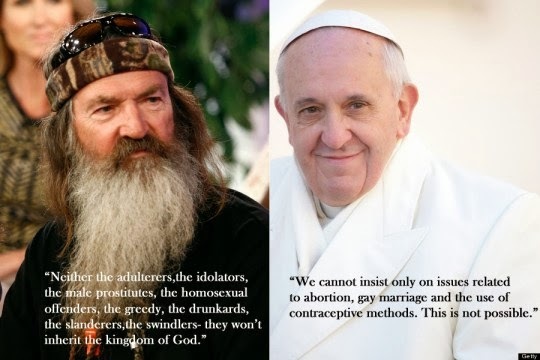 The point is that Phil Robertson is not “misrepresenting Christianity”. He is citing Paul verbatim. Now, one might argue that he is taking Paul’s statements out of context, but frankly I don’t even think that’s the case, because Paul’s indictments largely transcend his sitz im leben. Scholars tell us he was swiping temple prostitution (pederasty) as part of his attack in Rom 1:24-32 and I Cor 6:9-10, and while that’s undoubtedly true, it’s not the whole story. The apostle hated male homosexuality across the board. The flip-side, however, is worth noting: like the rest of the bible, Paul is silent on the subject of female homosexuality if Rom 1:26 points to alternative heterosexual behavior instead of lesbianism. This isn’t surprising: as the product of an honor-shame macho culture, he was (certainly) homophobic about male homo-eroticism, and (possibly) indifferent to female homo-eroticism. I admire Paul greatly as an historical figure and early Christian thinker, but I consider his views on (male) homosexuality to be obsolete — as obsolete as his instruction for women in the church. I take for granted there is nothing remotely immoral or wrong about homosexual behavior between two consenting adults. Jason Staples probably thinks differently. But where we agree is on how issues like this should be assessed. If someone is unambiguously upholding Paul’s position, that should be acknowledged instead of implying that he’s fabricating his own bigotry; if someone more admirable (like Pope Francis, whom I do have much respect for) is more delicately upholding Paul’s position, that too should be called out for what it is. When Islamic radicals cite the necessity of the jihad, they are doing justice to their Qur’an, and it’s not “Islamophobic” to point this out. It is not hateful to point out hateful passages or homophobic ones. If we’re going to confront problems like holy wars and homophobia, we need to do so honestly, and the honesty begins by acknowledging that problems like these are often embedded in the scripture of one’s religion. They won’t go away by pretending that they’re overblown, misunderstood, or even invented by fringe fanatics or bigots. I can’t remember the last time I read a novel like The Five. If you like suspense, horror, and rock music, then this book is tailor made for you. 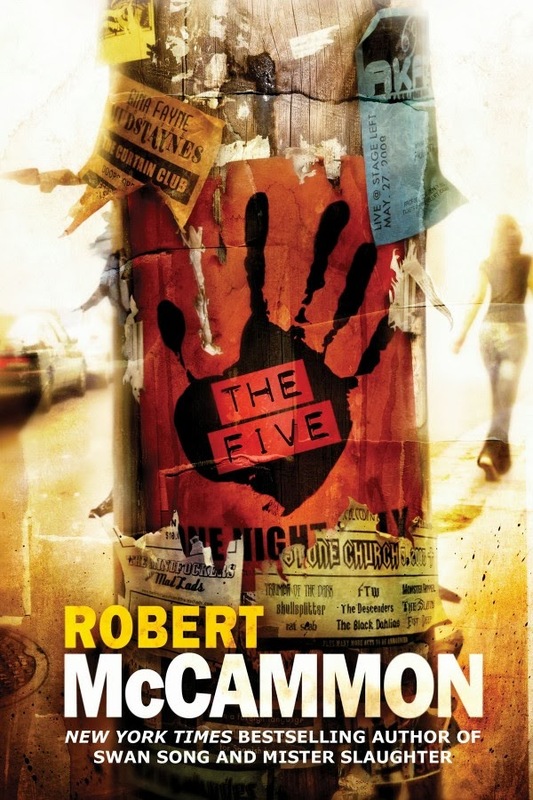 And for my money, it’s Robert McCammon’s best book since Boy’s Life. McCammon’s horror novels of the ’80s were great: he gave us Amazon women who slaughtered men by night in a remote Pennsylvania village; city-slicking vampires running over Los Angeles; the descendents of Poe’s Usher family; a Russian werewolf infiltrating Nazi Germany. But in the ’90s he broke the mold. First with Boy’s Life, a coming of age story so literary it deserved Cliff Notes, and still does. (Think The Adventures of Tom Sawyer meets The Prince of Tides meets the author’s unique elements.) Then with Gone South, a throttling page-turner about a man on the run from a tragic mistake, yet moving toward a weird redemption without knowing it. Like these latter efforts, The Five resists genre-labeling and contains moments transcendent enough to read like classic literature. So what’s it about? A dirt-poor indie rock band (called The Five, three men and two women), drive around in a van and play gigs across the southwestern U.S., chasing dreams of success. They finally get exactly that, but at a nasty price when a crazy ex-Marine sniper starts picking them off for comments made by the lead singer about soldiers in Iraq. Suddenly the band’s concerts swell in proportion to the media vultures, and with the fame comes devastation. It’s a nail-biter punctuated with slow pauses and soul-searching, both parts just as hard to put down. The narrative is saturated with the author’s love for rock n roll. It’s no mean feat to make a reader “hear” music off the page, yet that’s what I was doing — crafting my own mental jams and drawing on textures from favorite bands. (You’ll make your own associations, but I imagined The Five as sounding grungy like The Smashing Pumpkins and searing like The Walkmen.) This was especially true for the signature song written by all of the band members instead of the usual two: it takes on a curious life throughout the story, as it’s born of harrowing events and each band member finds his or her muse at the oddest, eeriest moments. There’s even some of the supernatural in The Five: it appears unexpectedly and with enough subtlety that you’re never quite sure if there is something ghostly or psychological going on. But for all its terrors, The Five is ultimately about the enduring power of music and the feverish creativity of artists. It’s a brilliant story, and one I’ll be reading again at some point. It’s interesting to follow debates about The Walkmen. I say the band’s later albums (You & Me, Lisbon, Heaven) are superior to the early ones (Everyone Who Pretended to Like Me is Gone, Bows + Arrows, A Hundred Miles Off). Those who believe oppositely won’t be fond this playlist, but for better or worse, they are my Walkmen picks, meant to be played in order. Naturally, “The Rat” caps it off — usually the last song played at concerts — and I kick it off with “In the New Year”, which is not only my favorite Walkmen song but one of my favorite songs of all time. 1. In the New Year. You & Me, 2008. 3. Louisiana. A Hundred Miles Off, 2006. 4. Line by Line. Heaven, 2012. 5. Song for Leigh. Heaven, 2012. 8. Red Moon. You & Me, 2008. 9. Stranded (Live). Lisbon, 2010. 10. The Rat (Live). Bows + Arrows, 2004. I started wondering about characters from other fantasies who are treacherous in the way of Walder Frey. The closest analogy I could come up with is a bit of a shocker: Aragorn, from Peter Jackson’s Lord of the Rings adaptation. Aragorn’s beheading of the Mouth of Sauron is an outrageous act of murder that makes him a war criminal. The Mouth was an ambassador, under the equivalent of a flag of truce when negotiating with the enemy, and obviously had diplomatic immunity. As he says in Tolkien’s Return of the King, “I am a herald and ambassador, and may not be assailed.” Gandalf agrees, replying that “you have naught to fear from us until your errand is done”. The Gandalf and Aragorn of Tolkien’s classic uphold the rules of diplomatic immunity; the Mouth of Sauron is under no physical danger from them, or from anyone in the Host of the West, during negotiations, even as the Mouth gloats over Frodo’s torture and the Ring being on its way to Sauron. Only when their meeting is over, and he retreats back through the Black Gate, does battle begin. The purists were right that Tolkien would have been appalled. This Aragorn stoops to a level that’s obscene by even Jackson’s standards. Don’t get me wrong: unlike the purists, I applaud the move, as I like protagonists who are deeply flawed, and Tolkien’s were never flawed enough. I like the war-criminal Aragorn in the same way I like the “Clockwork Orange” Faramir whose rangers sadistically beat the daylights out of Gollum at the Forbidden Pool; it’s excellent drama. What Jackson’s Aragorn did was clearly wrong, but it makes him more interesting than Tolkien’s hero. So there you have it. The film version of Aragorn is the closest fantasy analog to Walder Frey. Both did the unthinkable by murdering those under sacred immunity rights. The obvious objection to my analogy is that the people murdered by Walder Frey were decent and likeable, whereas the Mouth of Sauron was anything but, but that’s not the point. The fact that we identify with Aragorn’s pain and rage over Frodo doesn’t affect the conclusion here. Anger and helplessness are no excuse for murdering ambassadors at a negotiations meeting. (Jackson’s) Aragorn is just as treacherous as Walder Frey. A black swan in her plumage? I’d be in cardiac arrest before that point. Remember that gothic rock band from the ’80s, who lost their talent in the ’90s, and believe it or not are still cranking out the latter-day tripe? Well, I’m sticking with the golden oldies. Here are their ten best songs from the early days, ranked in descending order. 1. Beyond the Pale. 1988. Beyond censure. The band’s best song. 2. Garden of Delight (Hereafter Version). 1986. This haunting version completely buries the original. 3. Wasteland. 1986. The band’s most emblematic song, and the one that got me hooked. 4. Dance on Glass. 1986. Gothic to the core, evoking brutal fairy tales. 5. Tower of Strength. 1988. The band’s most popular and compulsive song. 6. Grapes of Wrath. 1990. It sounds like a national anthem, and damn if it still doesn’t give me chills. 7. Sacrilege. 1986. “Toss and turn on a cross to burn.” I played this so much in college it was ridiculous. 8. Severina. 1986. A gift from the gods. 9. Kingdom Come. 1988. A catchy, thundering ode to eschatology. 10. Hands Across the Ocean (Palmer Version). 1990. A real earworm, and better than the grating popular version.